Star Wars: The Force Awakens shattered box-office records as one of the highest-grossing films of all time, and its eagerly awaited sequel, Star Wars: The Last Jedi, is sure to do the same. Written and directed by Rian Johnson (Looper, The Brothers Bloom, Brick) and production designed by Rick Heinrichs (Fargo, The Big Lebowski, The Nightmare Before Christmas, Captain America: The First Avenger), this chapter, like every chapter before it, owes its visual language and fully imagined cinematic landscape to an incomparable art department: the Lucasfilm "visualists." 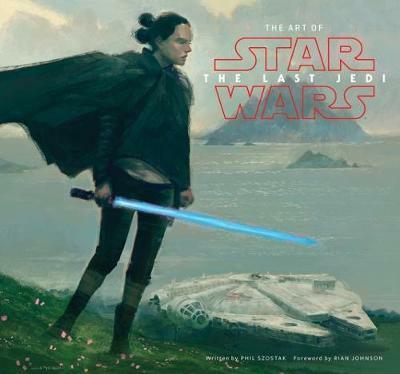 The Art of Star Wars: The Last Jedi explores their vision and illuminates their creative process in stunning detail. Featuring concept art and costume sketches, storyboards, and blueprints, fans will take a deep dive into the development of the fantastic worlds, characters, and creatures-both old and new-of The Last Jedi. Featuring unforgettable art and exclusive interviews with the filmmakers, this visual archive highlights moviemaking magic at its finest.